If you are a public health professional, you know that changing people's habits and behaviors can be challenging. We can help your audience of public health professionals understand those challenges with Levels of Community Change, an interactive, hands-on game that applies the social ecological model in the pursuit of policy, system, and environmental change. It engages public health professionals and others with real-life scenarios, challenges, and discussions, suggesting that effective health promotion strategies target individual change (education), and social, organizational/ physical environment, and policy changes. Customized scenarios make the game fun and relevant for teen and adult groups. The Levels of Community Change game comes with a 4'x4' vinyl mat, instructions and a set of 22 healthy behavior scenarios, a bean bag, and a plastic storage bag for the scenarios. All the items are delivered in a cardboard mailer that also serves as a convenient storage box. The game can be ordered HERE. If you are interested in using facilitators and multiple games to reach a larger audience, use these Facilitator Instructions to explain the game and procedures. Need a copy of the game instructions? These instructions are included in the kit above. You actually don't have to have the kit - it just makes playing the game very easy. These instructions include other ways to play, namely by creating your own inside or outside play space. Have a question about this product? 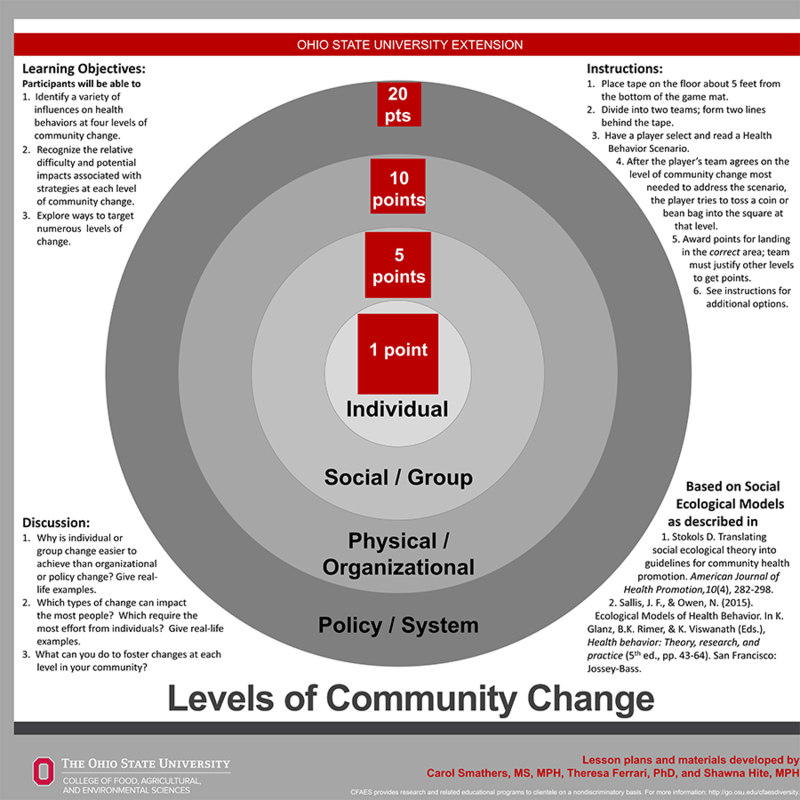 The Levels of Community Change game was created by Carol Smathers (OSU Extension Field Specialist), Theresa Ferrari (OSU Extension Youth Development Specialist), and Shawna Hite (OSU Extension Healthy People Program Specialist).